Race 9 of the 2017-18 Season and Heat One of the Summer and Season Point Scores. Aberdare, Alruth and Australia IV were back in action after their excursion to the Sandbaggers Regatta in Annapolis, U.S.A. to join the regulars with 7 skiffs available for today’s race, Scot having stood down due to insufficient crew. Conditions were overcast with a strong gradient NE breeze and the distinct possibility of a rain induced change from the west during the afternoon. Most skiffs rigged for the expected fresh conditions. A very low tide at launch time would make for a run-in tide during the race. Australia IV did not start and headed back to the club before their start signal with a bowsprit issue. Britannia was first away off 15 mins, followed by Alruth (13), Tangalooma (11), The Mistake (9), Aberdare (3) and Yendys off scratch. The skiffs enjoyed fresh conditions as they worked their way down harbour to the Beashel Buoy, with the breeze prevailing from the NNE. Britannia was first to round the Beashel Buoy for the run to Shark Island with the wind angle very square. Tangalooma was next to round followed by The Mistake, Alruth, Aberdare and Yendys. The skiffs enjoyed a fast ride in fresh conditions down to the gybe mark, with all deciding to take spinnakers down before the mark, then continue under main and jib for the reach on the second run to Clark Island. As the skiffs approached the Clark Island mark, light rain began to set-in and the breeze lighted off. 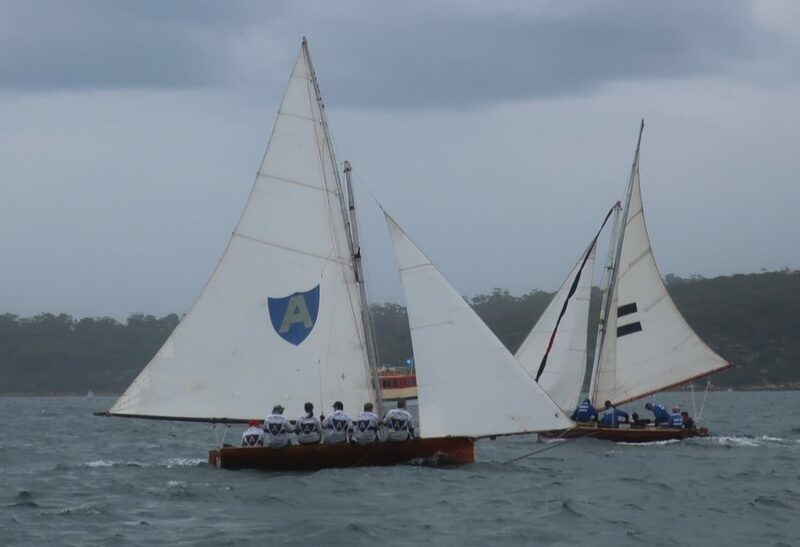 Britannia was first to round the bottom mark for the beat up to Chowder Bay, followed by Tangalooma, The Mistake, Alruth, Aberdare and Yendys. The fleet had closed up at this stage with the makings for a close contest as the race progressed. As the skiffs made their way upwind the breeze began to lighten off, then move around to the left – ie NNE, Nth, NW. While Britannia led the way mid-stream off Taylor Bay, Yendys was heading towards Bradley’s Head and was the first skiff to experience the sudden change of conditions as the westerly front swept in. Unfortunately for Yendys they were in the wrong place at the wrong time to be confronted with yachts approaching under spinnaker from the opposite direction as conditions changed from sublime to chaotic. Despite their best efforts the crew of Yendys had limited options to sail clear and succumbed to the elements – fortunately, they were towed to Lady Martins Beach and enjoyed the welcome hospitality of the RPEYC’s complimentary legendary tot of rum to ease their pain. 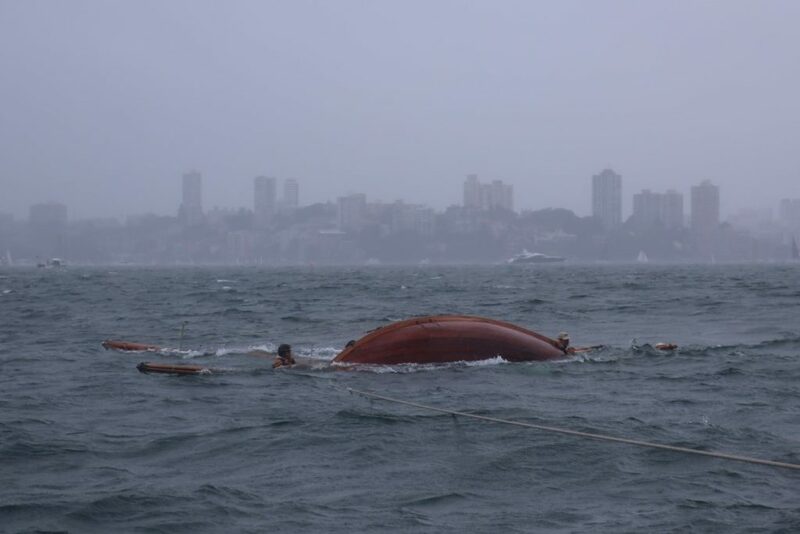 Britannia was caught out wide and exposed to the full brunt of the front and also succumbed to the elements, then towed to Nielsen Park beach. The remaining four skiffs battled their way towards the shelter of lee on the western shore. At this stage the remaining competitors were advised that the race had been abandoned by the Principal Race Officer. Tangalooma and The Mistake made their way to the beach at Chowder Bay where they un-rigged and eventually towed home. Alruth and Aberdare dropped their mainsails in Taylor Bay and sailed around in circles under jib. When conditions abated, Alruth re-hoisted their mainsail to sail home while Aberdare picked up a tow from the Rosman Ferry “Regal II” as it returned to the SFS. Everyone returned safely albeit a bit wet and cold. A big afternoon for the on-water support team. With thanks to our on-water support team of Barley, Stu, Russell, Roy, Peter, Adrienne, Chuck, Bill, Janis and Bill, post-race support from Ross, Angove Wines and the rest of our tireless volunteers, along with the dedicated team at Rosman Ferries. Also, thanks to the welcome and generous consideration by the Royal Prince Edward Yacht Club at Point Piper. We look forward to seeing you down at the Squaddie next week.